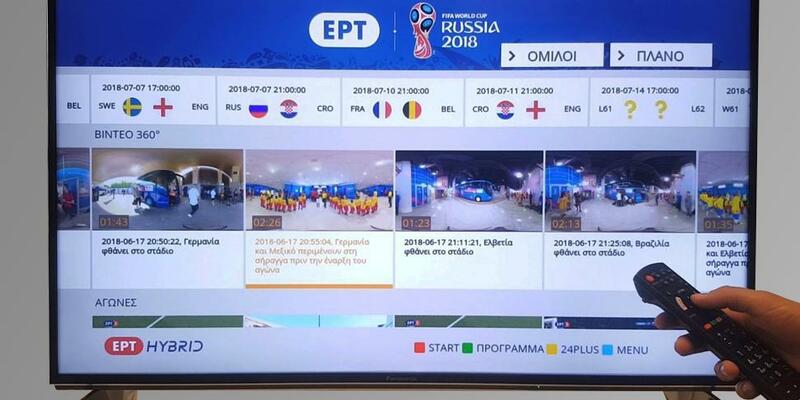 The Greek broadcaster ERT has launched the first of its kind HbbTV 360° Video Portal for FIFA World Cup Games in Russia. Main enabler for this offer is the “360° Video Playout” by Fraunhofer FOKUS, a unique and patented solution that enables the playback of 360° videos on nearly any device. As one of the first providers the Greek TV channel ERT offers new 360° video technology for their broadcasting of the current FIFA World Cup, providing viewers with a new and modern viewing experience. Viewers can watch more than 150 video clips for group matches as well as round-of-sixteen matches which are now available in the ERT’s Video Portal. This new viewing experience is made possible by cloud-based technology “360° Video Playout” which was developed by Fraunhofer FOKUS. The unique and patented solution enables the viewing of high quality 360° videos on nearly any device. Usually the delivery of 360° video material consumes a large bitrate and results in a considerable processing load to perform the geometrical view projection and rendering – which makes a smooth playback impossible even on modern devices with high processing and graphical computing capabilities. In comparison to other 360° video playouts which require high streaming rates the FOKUS solution is able to reduce the bandwidth requirement by around 85 percent due to the preprocessing approach, thereby offering the same video quality. The FOKUS 360° Video Playout system saves bandwidth by performing the rendering of the individual field of view at the server-side in a cloud based infrastructure. Only the selected high-resolution view is then streamed to the playback device, which reduces the bitrate dramatically. For example, the FIFA 360° videos are provided with a bitrate of 16Mb/s while the 360° video playout streams the videos with 2Mb/s by keeping the same quality. In this way the cloud-based solution allows the experience of 360° videos on TV screens as well as on any other low capability device. On top of that viewers can interact with dynamically inserted interactive objects which enrich the video experience further. The solution also allows advertisers to dynamically include personalized advertisements (ad-insertion).